Welcome and thank you for your commitment to students with disabilities! The purpose of this page is to acquaint faculty members with ODS procedures and best practices for the accommodation and inclusion of Wright State students with disabilities. The most crucial take-away of this training is to help faculty and staff understand their roles and responsibilities for facilitating accommodation(s) and access. It is also our hope to share some information about The Office of Disability Services (ODS) and the partnerships we hope to foster between faculty and ODS. Wright State University is committed to providing equal access to University programs and facilities for students, employees and visitors who self-identify with a qualified disability. In accordance with The ADA Amendments Act of 2008 (ADAAA) and Section 504/508 of the Rehabilitation Act of 1973, the University provides reasonable academic adjustments (accommodations) in order to minimize or eliminate the impact of a disability by allowing equal access and opportunity to participate in University programs. To maintain the integrity of the faculty’s academic content. The implementation of academic accommodations is a shared responsibility between the student and the course instructor. ODS is available to advise faculty on making appropriate accommodations that maintain their course’s academic objectives. Students registered with ODS are advised to contact their instructors regarding their approved accommodations, either before classes start for the semester, or as soon as the student becomes eligible for services. In some circumstances, it may be permissible for the professor to contact the student prior to the first class session or prior to the student personally broaching the topic of accommodations. Remember to conduct any conversation regarding accommodations in a private, confidential manner. When communicating with the student, an agreement should be made outlining how the requested accommodations will be provided during the course, within the specific framework of your course. Faculty should contact ODS if they have any questions about providing any approved accommodations, or if students request accommodations that are not listed on their accommodation notification email from ODS. How Will I be Notified of a Student's Request for Accommodation? Once their academic accommodations are approved, students must request their accommodations via their account in the ODS accommodations portal, AIM. Upon submission of the AIM request, a notification is sent to each of the students’ instructors, listing their approved accommodation(s) for each course. The notification is usually generated automatically from the AIM portal, directly to the course instructor’s University email address. Instructors may also receive messages from ODS staff members, especially if there are accommodation instructions that are very specific to a particular student. ODS may also contact faculty in order to understand course requirements while trying to determine appropriate accommodations for a student who is registered with ODS. The student and faculty member should have a private conversation to discuss how the accommodation(s) will be provided in the course. ODS is always available to consult with faculty about student accommodations. Feel free to contact ODS at any time if you have questions about accommodations, procedures, referrals to ODS. Who Do I Contact for Guidance? What Are My Responsibilities as an Instructor? Our partnerships with faculty are essential in providing access and engaging all students in University activities and educational programs. ODS can be a helpful resource for you to ensure that your courses are accessible to all students. You may also work with the Center for Teaching and Learning while developing content. Please refer to the ODS website for the most updated information, and feel free to consult with an ODS staff member at any time if you have questions, ideas, clarification, or need more information. How Do Students Register with ODS? Implementation of certain services may require additional action or coordination. Each student is provided with a letter that summarizes all of the accommodations and referrals discussed in the CAP meeting with ODS. Why Do Students Establish Accommodations? Reasonable accommodations are determined on the basis of each specific disability and the ways each disability impacts the student (some sort of functional limitation). Accommodations may be adjusted in consideration of specific course requirements, as well. In these cases, collaboration between the student, faculty and ODS is ideal, if not necessary. The needs among students with a disability vary greatly, sometimes even amongst those with the same type of condition or diagnosis. Therefore, accommodations are individualized on a case-by-case basis and are generally determined through an interactive narrative process with the student. Once the student is eligible for reasonable accommodation(s), they must request specific accommodations for each semester. When a student request accommodations for specific courses, the student’s course instructors are notified of the approved accommodation(s) via email. 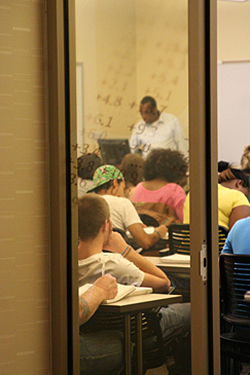 When students express intention to use the approved accommodations in a course, they are encouraged to discuss their needs with their instructors. During this discussion, an agreement should be reached regarding specifics of how the student’s accommodations will be provided in your specific course.